Annual Appeal - The Junior League of Boston, Inc. Your annual gift to the Junior League of Boston supports programs that inspire girls to live healthy lives and will provide opportunities for them to explore new interests. 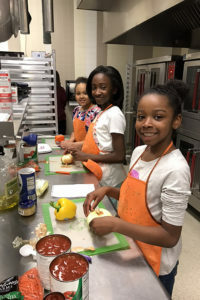 The Junior League of Boston’s nine active community programs in six local neighborhoods are led by members who are helping girls develop the skills and confidence they’ll need to thrive in life and unlock their own potential. Your generosity supports programs like Learning Circles at the Boys & Girls Clubs in Charlestown and Dorchester. Here, our members expose 9-to 12-year old girls to women of power, purpose, and position, and show them what‘s possible. With 1 in 4 girls in Boston living in poverty, it’s more important than ever to offer programs that provide girls with the opportunities and inspiration to reach their full potential. The lessons our members learn are preparing them to lead. Our members go on to serve other community and business organizations, and their league experience prepares them to excel. As you make charitable contributions at the end of the year, please include the Junior League of Boston in your giving.